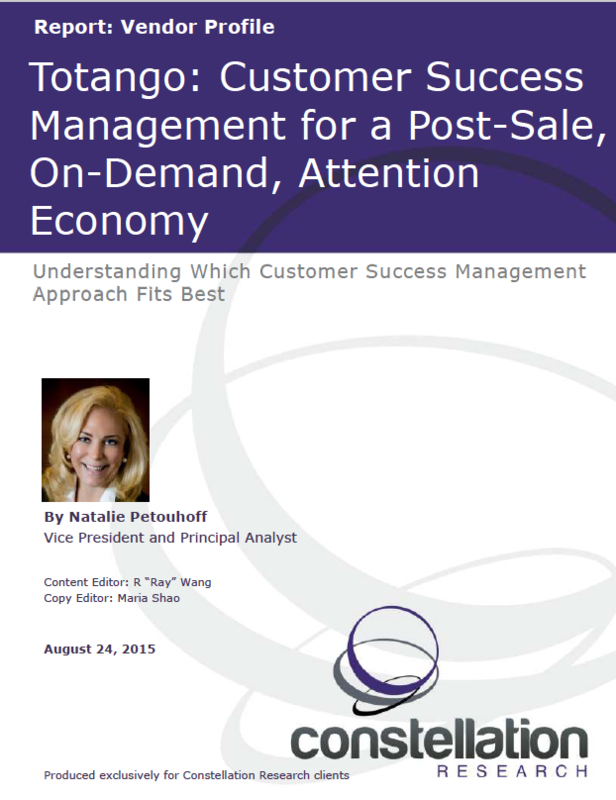 Totango: Customer Success Management for a Post-Sale, On-Demand, Attention Economy | Constellation Research Inc.
Totango, a vendor of cloud software for Customer Success Management (CSM). With subscription and recurring revenue models on the rise in software, Totango helps clients improve product adoption and advocacy, reduce customer churn, and maximize customer lifetime revenue. Using Totango, companies can pinpoint at-risk accounts that need attention; spot opportunities to increase user engagement and boost revenue; and then formalize and implement customer success best practices to scale up customer success operations across a growing customer base. This vendor profile provides an overview of Totango and identifies key differentiators, product offerings, and a short list guide for buyers.